Designed with input from some of the best drag racers in the country, Painless switch panels feature: Heavy-duty lightweight non-reflective housing designed to mount to a roll bar or dash mounted. Lighted rocker switches are color coded for quick visual reference. All circuits individually fused and easily accessible for quick testing and replacement. All units come complete with 18’ of high temp TXL wire using machine applied, vibration resistant, fully insulated terminals. Looking to mount your switches in the dash rather than on a roll bar? Then these new non-fused panels are your answer. Available in four, six or eight switch versions, these heavy-duty, light-weight panels are pre-assembled with vibration-resistant terminals and 18 feet of the best high temperature wire available. easy identification, 18 ft. of the highest grade TXL wire, vibration resistant terminals and a black finish for reduced glare. 50201 – 8-Switch flat plate style for in-dash mounting. Start, Ignition, Electric Cooling Fan, Fuel Pump #1, Fuel Pump #2, Electric Water Pump, Lights, Accessory (3 × 10.75 × 3.125). 50202 – 8-Switch self contained style for roll bar mounting. Start, Ignition, Electric Cooling Fan, Fuel Pump #1, Fuel Pump #2, Electric Water Pump, Lights, Accessory (3 × 10.75 × 3.125). 50410 – 8-switch Pro Street panel which includes: Push Button Start, Toggle-Ignition, Fuel Pump, Fan, Park/Head Lights, Turn Signals and Horn. (3 × 10.75 × 2.5). 50412 – 6-switch Pro Stock panel which includes: Push Button Start, Toggle-Ignition, Fuel Pump, Water Pump/Fan and Two Accessories. (3 × 10.75 × 2.5). Rocker Switch Panel mounts in radio/stereo location of Mustangs. Kit includes five heavy duty on/off toggle switches, one each of momentary and on/off/on switches color-coded TXL wire. Toggle Switch Panel mounts in radio/stereo location of Mustangs. Kit includes six colored LEDs, five heavy duty on/off toggle switches, one each of momentary and on/off/on switches color-coded TXL wire. Race quality carbon fiber switch panel adds styling and functionality to your Mustangs as well as provide a convenient way to mount switches. Mounts in the radio/stereo location of 1987-93 Mustangs. Hide-A-Panel fits in the ashtray location of 1987-97 Mustangs. Features four lighted rocker switches or a nitrous kit with three lighted rockers and one momentary switch for purge function. Each panel includes 18 feet of high temp TXL wiring. fully insulated terminals. These kits are shipped unassembled with peel and stick labels for custom applications. Following the successful introduction of our Off-Road Switch Panels in 2005, we had many requests for a similar panel but with a push button rather than a keyed start. So here you are, available as dash or roll bar mount and with four or six toggle switches. These kits are shipped unassembled with peel and stick labels for custom applications. These new waterproof switch panel kits contain extra switches to customize the panel for any use. 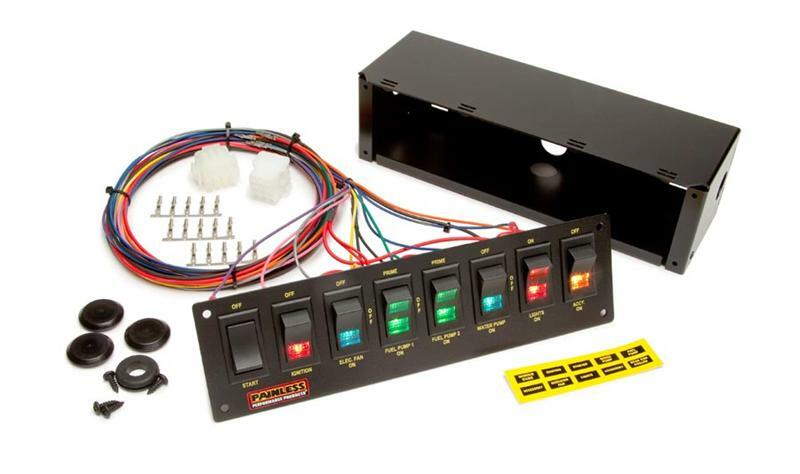 Includes momentary, on/off and on/off/on toggle switches with boots, choice of keyed or push button start and colored LED lights.These panels contain no wire but work great with our Extreme Offroad Harness #10144.